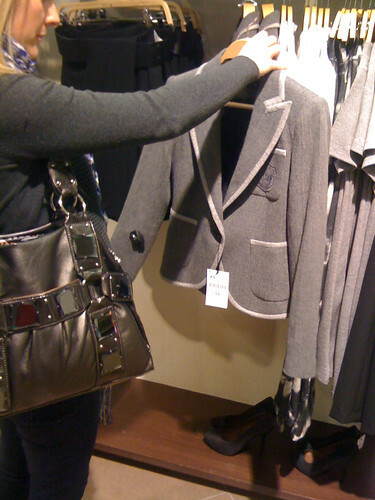 I was in Zara today…drooling! haha I saw so many things that I liked. As you may already know, I’ve been trying to control my shopping addiction lately so that I can go mad in the US next month! :) But I couldn’t resist a look. I love this wool varsity blazer. The fit was fabulous the price however, was not. €100!! Since I bought 2 varsity blazers from asos.com (http://short.ie/xn4p7m) a few months ago couldn’t possible allow myself to buy another. Especially since I haven’t worn the navy one! Blazers are an essential in my wardrobe. I wear alot of pretty dresses and skirts with statment shoes. Blazers add necessary structure to my overall style. I’ve found myself thinking about this item since I left the shop, this is not a good sign for my bank balance! I saw these shoes on display in Zara’s window. Although I really like them, anything with a strap high on the instep of the foot won’t work on me. I’m quite short so adding ankle straps make my legs look shorter. I am goin through a little obsession with grey shoes and boots lately. I’m not entirely sure why, I’ve just been drawn to them! My bag in the picture is by Kathy. It was a present from Chicago last year. It’s one of my favourites. It’s quite heavy to carry (even without anything in it!) but I love the colour and the shape. I find it quite annoying when the base of handbags are too wide, they’re almost uncomfortable to carry.